Calculated on an after-tax basis, social spending in the United States equals 17.6% of GDP. This is close to the OECD average of 17.8%. The United States spends about 25.6% of its GDP on social purposes. Only France and Belgium have a higher ratio of social spending to GDP in the OECD. One of the clichés about Europe is that it has, compared to the United States, an excessively large welfare state. On the surface, the numbers on public spending for health care, pensions, unemployment and other social benefits seem to support this perception. <!-strCallout1->Before the global financial crisis struck in 2008, public social spending — the total amount of resources committed by the government in the areas of pensions, benefits and health care — in the OECD’s European countries amounted to an average of about 21% of gross domestic product. In France, public spending reached 28% of GDP, and in Sweden 27%. In the United States, by contrast, public social spending was just above 16% of GDP — and significantly below the OECD average of 19.7%. And while the economic crisis has driven up social spending in virtually all OECD countries, the relative ranking of countries based on public social spending has remained largely unchanged. So does that mean the cliché is factual? Perhaps not. A recent study by the OECD found that the conventional way of comparing the size of welfare is incomplete — if not genuinely misleading. The most obvious reason is the tax treatment of social benefits. In Sweden or Denmark, recipients of public benefits will send back to the “public purse” more than 25% of their transfers through income tax or other direct taxes. In the United States, however, most social benefits are paid almost on a net basis. Just about 6% of all social transfers are subject to these taxes. The average tax burden on social transfers throughout the OECD is about 9%. And even more taxes are due when the money is spent. For every euro or krone a pensioner spends in Luxembourg, Ireland or Denmark, about 20 cents will return to the public budget in the form of a value-added tax, fuel tax or other taxes on consumption. In the United States, consumption taxes divert only about four cents of every dollar spent into public budgets. Tax breaks on private social spending is another factor that is not included in the conventional way of calculating social spending. Many countries grant such tax exemptions for private health insurance or for contributions to private pension schemes. They are usually not regarded as social expenditures because there is no cash flow from the state to the individual associated with these benefits. 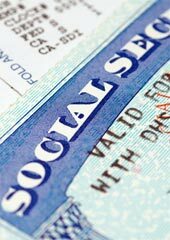 Social programs such as the earned income tax credit, which offsets Social Security tax payments for medium- and low-income U.S. workers, would also not show up on conventional calculations for social spending, although they are very similar to cash payments. <!-strCallout2->On average, these tax breaks with a social purpose amount to about 0.5% of GDP in OECD countries. In the United States, their total volume almost reaches 2% of GDP, with tax credits for private health insurance making up the largest share. When public social spending is calculated on an after-tax basis, rather than a gross basis, social spending in the United States increases to 17.6% of GDP. This is close to the OECD average of 17.8% — and more than Canada spends on social purposes. The picture changes even further when social spending is viewed from a household perspective. Here, the relatively high level of spending on private health care and the important role of private pensions in the United States kick in. The total volume of this private spending is four times higher in the United States than the OECD average. With all net public and net private resources taken into account, the United States spends about 25.6% of its GDP on social purposes. This is the third-highest ratio of social spending to GDP in the OECD. Only France and Belgium devote more resources to social purposes. There are still important differences between countries, of course. Cash benefits — which are more common in European countries — tend to redistribute income to households with low earnings. It is the middle and the upper-middle classes that typically benefit from tax breaks, simply because in general one has to pay a tax before benefiting from favorable tax policy treatment. But these technical differences don’t obscure the basic fact that the U.S. and European welfare states are a lot more similar in magnitude than is commonly supposed. An acknowledgment of this might go a long way in changing how Americans feel about their government and its role in their society.